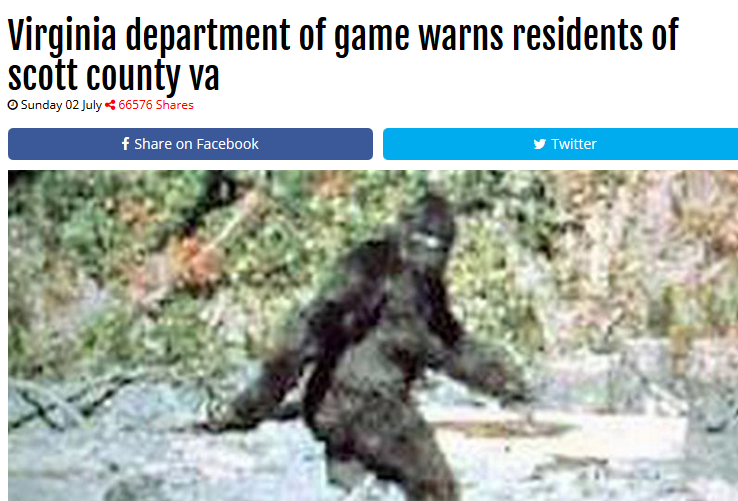 Social media has been burning up with the Breaking News Virginia Department of Game warns Residents about Bigfoot Story. This "report" has been shared in numerous bigfoot groups and pages on Facebook and other social media sites. I personally have been tagged in the story a few times and been sent the story in private messages. 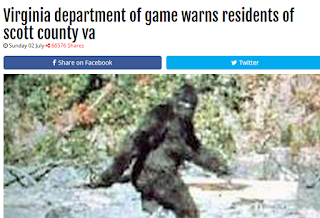 The story tells about how the residents of Scott County, Virginia have been warned about a sighting of a male bigfoot. The story states that deputy Jeff Spicer confirms there has been two sightings of the bigfoot creature. The only problem is that the report is a total fake and comes from a "create a joke" site. While it appears many have taken the fake news story as real, it is totally unreal and easily provable to be a hoax. If the viewers/readers of this report would only scroll down to the bottom of the page they would see there is a "Create a Joke" button and a disclaimer at the bottom of the page. Now, just for fun, I have also created a joke as an example. 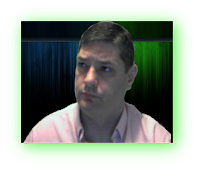 Check it out by Clicking here enjoy.